A hot new digital device could let sinister—or at least annoying—forces read your mind according to this intriguing if overwrought exposé. Google Glass, a tiny computer worn like eyeglasses, projects an optical display into the user’s eye. It has already been accused of everything from welding people even more closely to the Internet to violating privacy by enabling wearers to surreptitiously take photographs and videos. The author adds an ominous new possibility: Google Glass, he contends, could divine its wearer’s conscious and even unconscious thoughts, emotions, “temptations, cravings and strong urges” and reveal them to third parties. Wedam, working from a close if sometimes-disorganized exegesis of Google patent filings, explains that Google Glass meticulously tracks its wearer’s eyes and, possibly, pupil dilation; it knows when you are gazing at a fashion ad and how aroused you are by the pretty dress you see (or the model wearing it). It can also, he notes, detect “saccades”—the tiny, rapid eye movements that give away mental preoccupations we aren’t consciously aware of, although he doesn’t explain how the computer could differentiate the myriad possible subconscious states. 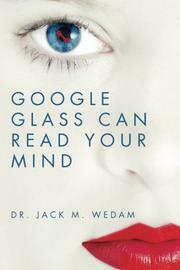 Written in straightforward prose that makes technical issues accessible to laypeople, Wedam’s brief account of the eye-tracking technology that makes Google Glass possible, and the neuro-cognitive science behind it, is lucid and compelling. It also raises timely and unsettling questions about the subtle intrusions of digital technology. Unfortunately, while he harps on the menace of Google Glass to privacy and autonomy, he fails to actually demonstrate it. He invokes the specter of marketers sussing out and manipulating our secret desires and makes dark references to “nefarious hackers,” but he never explains what harm will come of all this other than, say, an augmented bombardment of pop-up ads. The incursions Wedam spotlights seem more tiresome than threatening, as inevitable in the digital age as death and taxes. An engrossing look at the eye-tracking wizardry of Google Glass that doesn’t quite bear out its own alarmism.